Roswell Parks & Rec.. we love you.. but do you love us?? Your fence tells me you don't. The fence at Roswell Area Park Pool is definitely meant to keep people out. Could our parks and rec department, the best in the state, do a better job of placemaking? I've written before about their obsession with the Security Alert signs. Makes me feel so welcome and safe. On the topic of fences, I truly think we could do better evidenced by the Sunnyside Gus Ryder Pool fence in Toronto. The fence still exists and a person who climbs this and enters the pool is not the responsibility of the city at that point.Seriously, you would think our parks were straight outta compton with the barbed wire and the Security Alert signs. This street is a one way street. If you are unsure of what that means, it means that you cannot make a right turn here. If you have somehow missed that, you may also see the DO NOT ENTER sign on the right side of the road. If you have missed the DO NOT ENTER sign, you are now driving down a narrow street with very little traffic that is perfectly suited to be a two way street. Redundant Signs in front of home in the historic Mill Village. So picturesque. Triple stamping the double stamp. Even more sign redundancy in the historic Mill Village. Stop the Madness: Bicycle Riding Dogs? Fear not ATLiens. 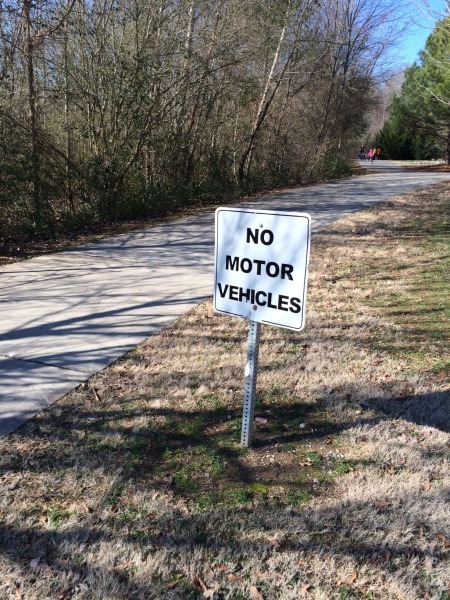 The Piedmont Park Conservancy has rid the jogging loop of one of the most perilous of park nuisances. There will be NO Bicycle Riding Dogs henceforth on the jogging loop. Norman the Bicycle Riding Dog.. you are no longer welcome here. Hat tip to my brother in law, Krish Dhokia, for the pic. 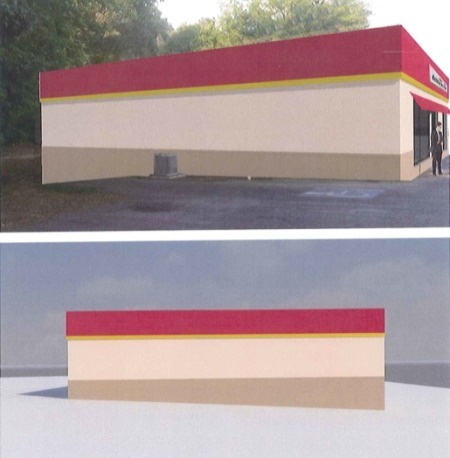 It's hard to imagine a building that is less imaginative than this one which is proposed for 1275 Alpharetta Hwy. I think the last picture pretty much sums it up. I guess it's hard putting lipstick on a pig. Do we need another used car dealer on Alpharetta Hwy? I'm excited to announce that we soon be unveiling a brand new road sign at the Canton Street, Magnolia, Atlanta Street intersection. I can't imagine one additional sign that is necessary at this intersection. However, the ceremonial removal of that black garbage bag will undoubtedly usher in a new era of safety at this intersection. As an aside.. do we really need two sign posts here for GA 9 North and GA 120 East? Stop the insanity.. seriously!